Bears - Always a threat! 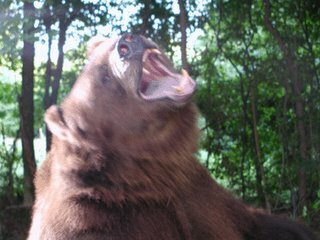 Bears are a large, furry mammals that have sharp claws and teeth, they eat meat, usually fish, and they are after our picnic baskets and honey. Any responsible Colbert Report fan knows the dangers of bears and remains wary of their prowess and dark, mystical powers, but does the average Joe know the true dangers of bears? Do they realize how dastardly these fiendish animals are? 1. Bears like honey, and will stop at nothing to get honey. What animals makes honey? That's right, bees! Who likes bees, I mean they sting like the dickens. Bears are allied with the bees, watch your back!!! 2. Bears drink Coca-Cola, a major softdrink conglomerate. Coca-Cola has contained cocaine. Bears are allied with Colombian drug lords. 3. Bears steal our picnic baskets. 4. Bears like the porridge 'just right' which is code word for chunks of human floating around in it. 5. Bears bite, I mean they really really bite. Not just a nibble, but a huge freaking bite. 6. Bears are allied with Megatron. Yes, Megatron, the eternal enemy of the Autobots and arch-enemy of Optimus Prime. Would you trust something which allies itself with Megatron?? ?